Налични са кани от 120 до 1300 л.
Patented “OIL FREE” planetary movement, without oil and gears. No risk of oil leakage into the dough. “Sanitary” design of the working chamber without gaskets and sharp edges. Planetary group made of two mixing tools and one bowl scraper following the full internal profile of the bowl. Scraper and mixing tools speed programmable by inverter. Pressure/vacuum mixing available as option. Heated/cooled bowl available as option. Possibility of automatic ingredients loading and product discharge. PLC system for recipe and speed storage. Wide range of mixing tools available. 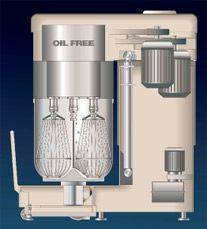 As all Sancassiano mixers, also our PLT can be integrated in automatic mixing equipment.